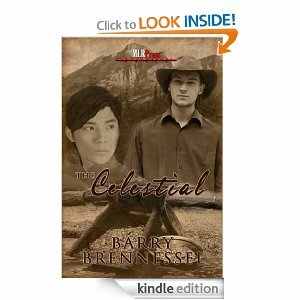 Brennessel, Barry, “The Celestial”, MLR Press, 2012. Barry Brennesel is a dynamic young writer who I was fortunate enough to meet at this year’s Lambda Literary Awards after party and I feel very fortunate that he asked me to review his books. This time he has written a historical novel set during the Gold Rush of the 1870’s. We meet nineteen year old Todd Webster Morgan who is in California looking for gold and finding love. He is determined to find the gold in “them that hills” of the Sierra Nevada’s and as he plans everything out, he meets Leo Jian, a young Chinese immigrant. Todd’s mother has not been having an easy time of making ends meet and his invalid uncle begins to show signs of anger and violence. To make matters even worse, Todd cannot find a job. However there is a ray of hope and that is seen in his friendship with Lao Jian and the two men find themselves falling in love with each other. However, because of growing anti-Chinese sentiment in America, the two find their relationship at risk and they are forced to deal with prejudice and fear. The writer chose to set this novel during a rough period of United States history. The War Between the States had ended just a few years before and the West was just beginning to open up. People still referred to California as the wild West and America was dealing with slaves having become free men and there was a great deal of prejudice against anyone who was not “white”. It was also a time in this country when there were people who were very poor and struggling to stay afloat and Todd thought that since he could not find work, he would look for gold and as he begins his search he comes face to face with some of the worst things about his country and its prejudices. He also meets a man from China for the first time in his life. It is this meeting that propels the novel forward and Brennessel not only gives us a love story but also a look at this country during a trying period and the emergence of California. We also get a look at racism in the way the Chinese in this country are regarded. Keep in mind that it was not that long ago that Lucille Ball and Desi Arnaz were regarded as a mixed race couple and this was long before that when anti-Chinese sentiment in this country was at all time high. Add to that the lovers are both men and we get a good look at intolerance. While the story is basically about Todd and Jian’s love for each other, they serve as the backdrop for hate and racism and the writer deals with these issues with grace and style. In writing a historical novel, one must be careful not to mess up in retelling what went on back then and I must add that Brennessel has done his homework and research well. Without giving away any of the details of the plot, the ending of the story left me wiped out. The writer is not only a wonderful story teller but he has also provided us with two wonderfully drawn characters thus giving us a read that will not be soon forgotten. This entry was posted in GLBT fiction on September 29, 2012 by Amos.